Today's outfit is one I wore to wear errands on my day off. Popped to weigh in and did the weekly shop, all very dull. 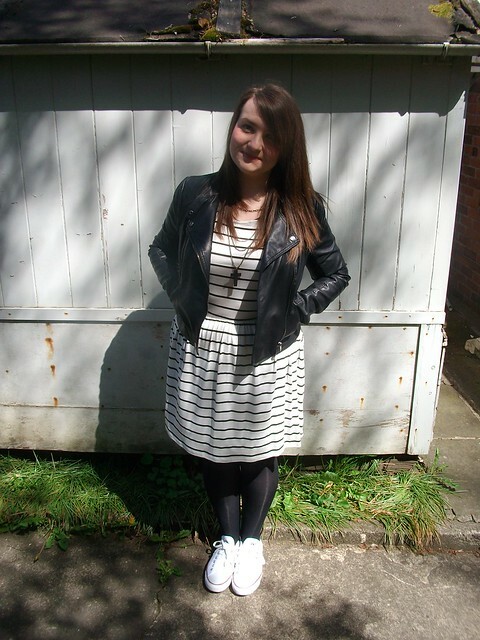 I picked up this dress in Primark ages ago and it was only about £8, I have them in a few colours and I think I will get loads of wear out of them this summer. They are so light and you can wear them with anything. 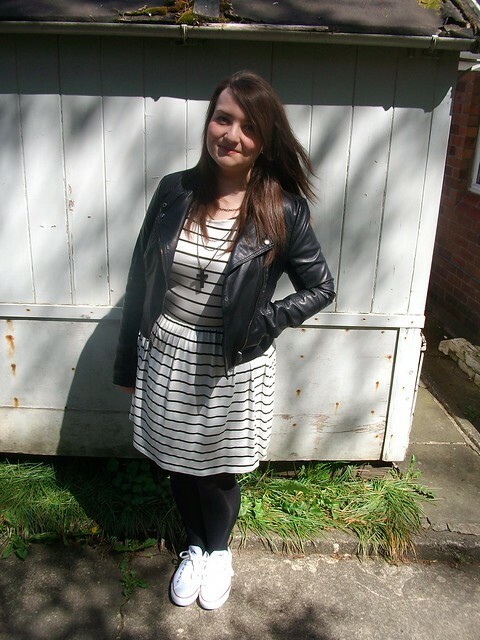 Still in love with my Topshop biker jacket, I wear it nearly everyday. I picked up this necklace on eBay for about £1.50, took a few weeks to arrive but you can't argue for that price. I don't think it is in stock anymore but the seller has lots of other lovely pieces for around the £2 mark. I'm super excited about going to a library conference tomorrow, such a work geek some times. I will be able to put faces to twitter names of lots of Welsh library folk I follow on there. Got any exciting plans this week? I'm going to the circus! And on Saturday I'm going to switch my longish hair for a pixie cut. I'm looking forward to that more than the circus, which is probably weird. That is the perfect jacket. The library conference sounds quite fun, I know so many people that work at libraries, I'm kind of envious that I've never been hired at one. I don't really have any exciting plans for this week... just kitties, video games, and boyfriend time. Great outfit - and the library conference sounds rather interesting! Hope its fun! 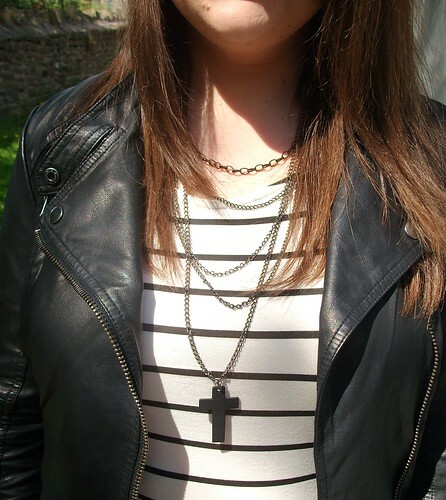 Cool necklace, and such a bargain too - well done! Looking as lovely as ever Gem! We're dress twins! I wore this to work the other day and 2 students had it on too! So simple, but so cute :) Love the biker jacket! I want this outfit on my person now! Ha I think "my person" is such a weird phrase. You do look fab though. I love this outfit Gem! It's something I'd wear in a heartbeat, I actually have the exact same necklace. You look awesome. You look amazing, I love that jacket!